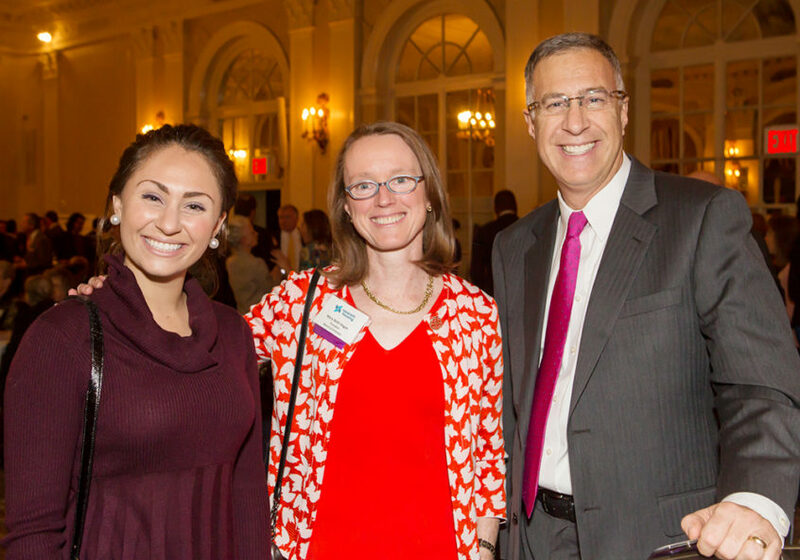 Nazareth Housing friends and supporters celebrated a year of growth and success on October 26, 2015 at the Yale Club. HOUSING FOR ALL was the Annual Benefit’s theme and more than 250 people filled the ballroom to hear firsthand two clients share their personal journeys on the path to safe and secure housing in New York City. Guests toasted honorees: Michael A. Zarcone, Dominican Sisters of Sparkill, and Gloria Colazzo. Michael A. Zarcone, Executive Vice President for Corporate Affairs at MetLife, Inc. and chair of MetLife Foundation, received the Corporate Leadership Award, honoring his dedication to helping low-income New Yorkers access financial tools, transform their lives and build housing stability. Dominican Sisters of Sparkill, founders of Thorpe Family Residence, received the Community Service Award honoring their 140 year commitment to seeking justice for the powerless and oppressed, enabling women and children in poverty to find homes and hope. Gloria Colazzo, Lower East Side community leader, received the Sister Marion Agnes Daniel Legacy Award in the spirit of Sr. Marion Agnes, her neighbor and friend. Gloria is an advocate for those in need, a kindly presence to countless neighbors, and a faithful partner in the work of Nazareth Housing. Board President Mary Beth Hogan stated, “During the last fiscal year, Nazareth Housing’s homelessness prevention programs helped keep 783 families in their homes. Think about what that means to the children in those families, not to mention the adults.” Nazareth Housing is proud to have shared the night with outstanding honorees, the Board of Directors, staff and the many supporters who gathered for the event. A 501(c)(3) not-for-profit, non-sectarian organization, Nazareth Housing was incorporated in 1983 under the innovative leadership of founder Sr. Marion Agnes Daniel. More than thirty years later Nazareth Housing continues to deliver social impact by providing supportive and low income housing, homelessness prevention services, urgent needs assistance, and emergency family shelter. Since 2006, nearly 21,000 unduplicated households have been engaged in these critically needed programs. Nazareth Housing is a HUD certified housing counseling agency, and the only HUD certified agency in New York City that works exclusively with low-income and fair housing rental issues. For more information, visit www.nazarethhousingnyc.org.